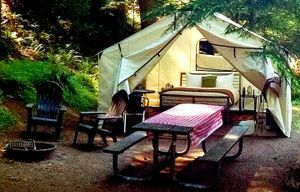 Classic trailers are our latest find in a search for glamorous camping around Western Washington. 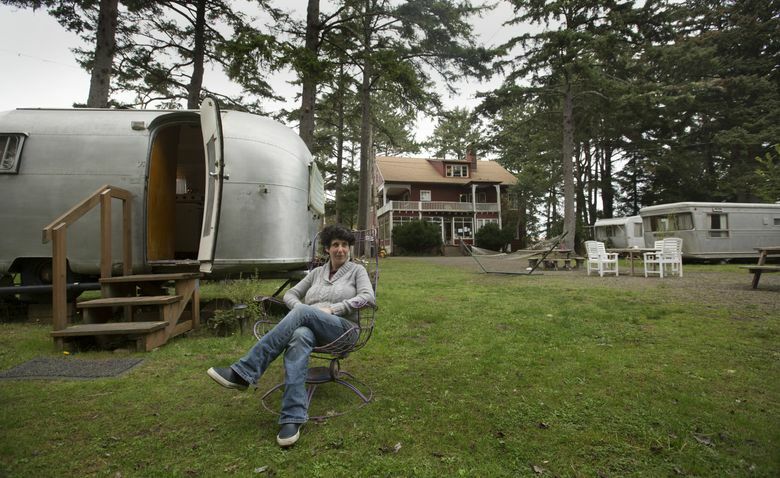 Get out to the slightly mystical village of Seaview on Washington’s Long Beach Peninsula to stay in an Airstream or Spartan trailer. Vintage trailers, mostly from the 1950s, are located on the 3-acre property of the historic Sou’wester Lodge, nestled among pines three blocks from Highway 101. If traffic is with you, Seaview is about a 3-hour drive from Seattle and, with its Victorian architecture, seemingly more than a century distant from modern times. There are more than a dozen trailers, ranging from the cozy and basic to some so large and fancy it’s hard to call them “camping” (glamorous or otherwise). Five of the smaller trailers, with names such as “Potato Bug” and “Arrowhead”, are classified as “rustic,” though all have full-sized beds and cooking amenities. Bathrooms are available in a covered pavilion, and there’s also a sauna, spa and outdoor kitchen. Trailers all sit in the same field, so it’s a lively site, said owner Thandi Rosenbaum. After-10 p.m. quiet hours are enforced. The Sou’wester also offers a 14-foot-by-18-foot canvas Elk Hunting Tent that sleeps two, with a woodstove. An artist residency program offers discounted rates to those seeking to polish their work at the lodge. The lodge itself — the former 1890s vacation home of U.S. Sen. Henry Winslow Corbett — offers frequent concerts, yoga, and body-care workshops. Seaview has numerous restaurants and bars. The town has an “untouched” feel, said Rosenbaum — no streetlights line the Seaview Beach Approach road, so nighttime walkers heading west “witness the awesome expanse of the land and the ocean.” A five-minute walk takes you to the beach and a bike path, the Discovery Trail, which runs along the ocean through parts of Cape Disappointment State Park and to the north end of the town of Long Beach. The state park offers 8 miles of hiking trails. Sou’wester Lodge, 3728 J Place, Seaview, Pacific County; $80-$118 a night for “Rustic” and “Baby” trailers, two-night minimum stay for Saturdays. souwesterlodge.com. Andie Waterman: 206-464-2052 or awaterman@seattletimes.com. On Twitter @WaterAndie.